Especially for a gift, a personal laser engraving can be the icing on the cake and a long-lasting memory. Due to our partnership with LaserSigns we are able to offer you a high-quality laser engraving at cost price. Ultramodern YAG-laser equipment guarantees for the perfect result. The pride ownership and our high demand for perfect craftsmanship makes this personalized gift absolutely unique. Raster images can not be used directly and need to be vectorized (needs a high resolution image) or needs to be redrawn in CAD. Costs depend on the neccessary effort for reworking the image an of course on the quantity of drives ordered. Aluminium-Inlay Thanks to CNC technics an individual aluminium inlay the shape of your company logo is no problem. How to order Easy and uncomplicated! 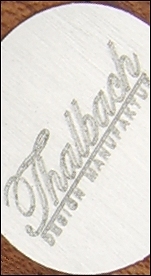 When placing your order, just add a note that you wish a personal engraving (default would be our Thalbach-logo), what font should be used (please see below at "Example fonts") and what text should be engraved. The fonts illustrated below (regular and italic) should help you with your decision of what might look best with your personal engraving. If you like us to use a specific font that is not listed below, we can of course do that as well - as long as we have the font available or otherwise you send it to us as .TTF-file.